I am a big advocate of life-long learning. What I like about this quote is that it reminds us of something very important. When someone tells you that you can’t do something it is time to be grateful. Doesn’t that sound very confusing? Why would you be grateful somebody is basically telling you that you are not enough? This day and age if there is anything we have an abundance of it is information. It used to be that if you wanted to learn anything you could go to the library and with a little effort and some research you could find an answer, free of charge! Today it is even better. When you have a question you can just ask google, Suri or whatever online search tool you use and there is the answer! If words are not your thing you can even pop over to YouTube and watch a video of someone doing the very thing you are trying to learn. What this means is that we can choose to be an expert in just about anything. One important thing to remember is this – you can’t pay anyone to do your push-ups for you. That is a quote I took from Zig Ziglar. It means there is a certain amount of effort to be put into anything, but with today’s technology you have the best chance of succeeding and showing anyone that you can do anything! Here is a quote I have always enjoyed. So much so it is in my book A Happy Life for Busy People. What I am encouraging you to do today is stop and think about this for a minute. Let us picture taking one of those wonderful long hot showers. Maybe in one of those spa showers where water comes at you from every angle. Using your favorite body cleanser lathered all over. Before I lose you in a blissful shower fantasy, let me ask you a question. Even after this amazing shower how would you feel 3 days later if you didn’t bathe again? Probably not so fresh. Why not? Well as we go through life working, playing or even sleeping there is dirt, sweat and even oils from our own bodies that start to collect and make our appearance, if not our smell unpleasant to be around. The same holds true for our emotional well-being. Even if you just finished reading an amazing life-changing book (please see above) or attended a seminar by said author, things may not last so long. Is that because the material didn’t work? Absolutely not, no more than the soap did not work in the afore mentioned shower example. You could leave the book or seminar very motivated filled with great tools to positively change your life. That might last 2 days, or even a week. Eventually, however, you will get ‘motivationally dirty’ again. Just like the dirt that collects on the body, there is emotional dirt that collects in our spirits. Negative coworkers, the media, traffic jams. They can all chip away at the feeling of happiness and motivation we have. That is why it is so crucial we replenish our emotional and happiness reserves. How can we do that? Keep something motivational to listen to in the car. Maybe subscribe to one of the free apps on your phone that sends you inspiring quotes every day. I certainly recommend signing up to follow this site daily to fill your inbox with tips to improve the quality of life every day. So next time you find yourself feeling a little down, remember to take your motivational shower and wash off all that negativity. This is me…I believe that I am lost in thought here. At least that is what I am telling myself. 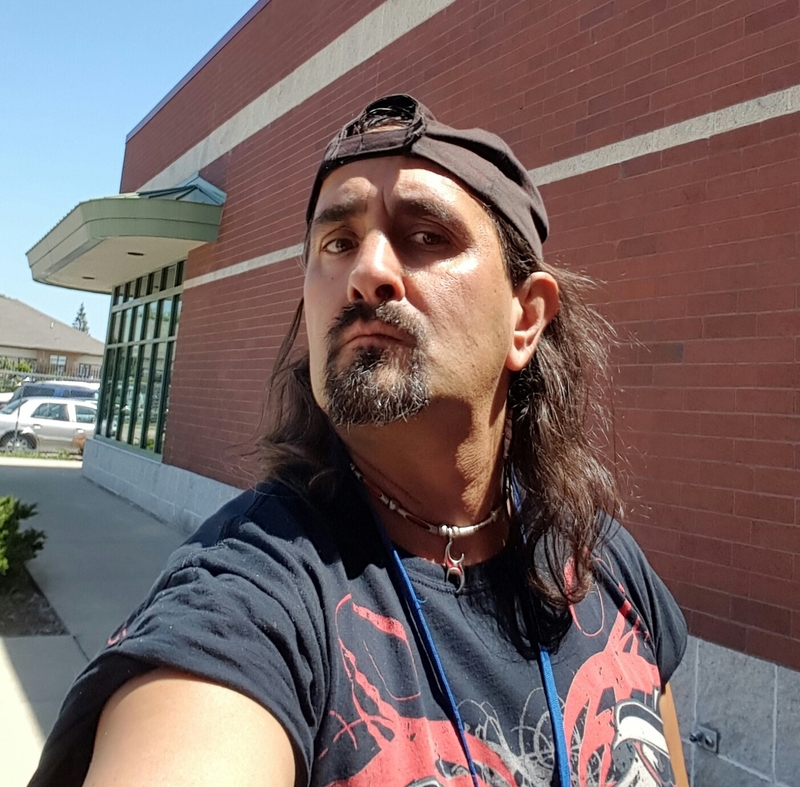 If you have read my book or followed this blog for any length of time you know that I am an advocate of filling your life with motivational and inspirational things daily. In addition to that I recommend listening to them over and over again. Why would we want to listen to something we have already listened to? Wouldn’t we be better served listening to something new? Actually we should do a mixture of both. As to why we should listen to the same message several times, it is to get the most out of it. Depending on our mood at the time we can hear and look at things in an entirely different way. Another reason is that as we experience different things in life we can appreciate things differently. Getting married changes our perspective on relationships. Being in a different economical bracket can change our opinions on what places to eat at. It doesn’t have to even be such major changes. Meeting new people, learning new things can all change how we view the world. Sometimes it takes hearing something several times for it to click. Still the one that finally made it click was a video by Greg Plitt the late fitness model and motivator. I was close to hyperventilating on a treadmill while watching one of his videos. In this video he talked about people who go to the gym for the month of January and then give up because they are not seeing any results. He used a very great analogy. Imagine your body as a lump of cold clay. You place that clay on a pottery wheel and begin to try and shape it. You put some water on it as well as the friction and heat of your hands. What happens? At first not much. The clay has been sitting like that for quite some time, so even if you push very hard it will not move much. Now, keep spinning it and rubbing it with your hands and the clay begins to warm up. That is like starting to go to the gym when you are out of shape. Your body has not moved for years, now suddenly you are moving and working. It is like pushing on the cold clay, it doesn’t change very much. After the clay begins to heat up, however, it begins to get easier and easier to mold. If you stop and let the clay get cold again, you have to start all over. Most people just get to the place where they are about to see changes, or when the clay is warm if you will, and then stop. If only they had pushed on a little longer they would have seen the beginning of the results they were seeking. Ok, great story, but what does it all mean. I realized then and there (maybe lack of oxygen had something to do with it) that everything truly worthwhile in life I had to give something to get. When I learned to bartend I studied great communicators as well as drink recipes. When I was getting in better shape I had given up some of my free time to the gym. If you are looking at a specific goal take some time to think what you may have to give up to get that goal and start giving! 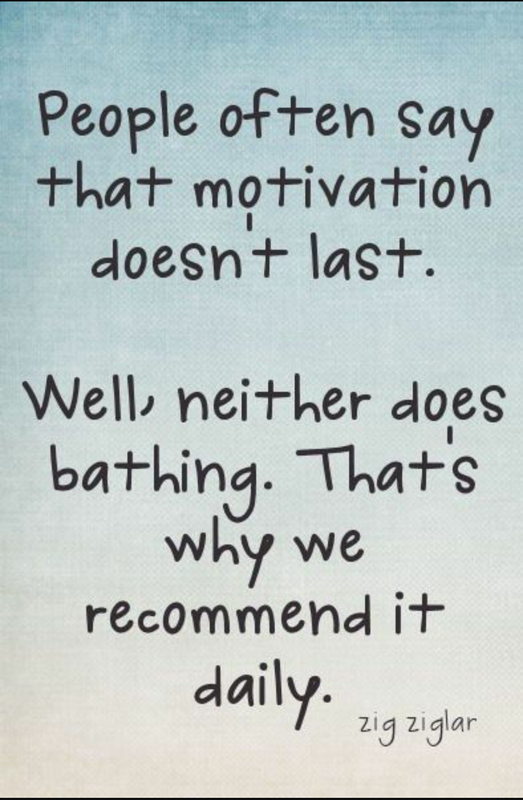 To paraphrase the late Zig Ziglar motivation expert and author, Motivation doesn’t last, neither does bathing that is why we must do it daily. So how to capture this? How can we work in motivation every single day with limited or no effort on our part? How can there be a reminder every single day to seed our mind to greatness and expand our compassion and our drive for success. The answer can be found on your wall, or on your desk, or on that table by the television. It is a great tool that is often overlooked. The day by day calendar. Whoever started this great idea was on to something. it is getting to be that time of year where calendar stores start popping up at your local mall. I strongly suggest paying a visit to one. For roughly the price of one dinner out you can be treated to daily motivation right in your home! They have calendars for all different angles. Trying to become more driven? They have calendars for people who are starting their own business. looking to create more peace and tranquility in your life? Try a zen calendar. The one I am currently using is ‘insight from the Dalai lama’ he is a man I greatly respect and his words give me a lot to think about as I go through my life. All I do to accomplish this is tear off a little piece of paper as I grab my daily cup of coffee. Think of whatever goal you are aspiring to, now imagine 365 powerful thoughts towards its creation. All of them already written and waiting for you with no effort on your behalf. how much closer to accomplishing your goal, whether it will be to be more relaxed, prosperous or enlightened if you could focus on it in a different manner 365 ways in a year. a great thing about these calendars you can tear off the sheet, which is roughly 4 inches by 4 inches and take it with you. fold it up and put it in your pocket/wallet/purse whatever. Then you can take it out and think about it several times a day. My aunt who either has far more ambition, time or both than myself even saved a few of her favorites and made a scrap-book of them. Thus, they can keep inspiring her for years to come. Now if I could only find that calendar with beautiful beaches, lovely island girls and motivational quotes I would be set. Seriously, stop by your local calendar store and take a look around, see what may work for you. Also there are nice little desk calendars and even wall calendars that can provide you with inspirational thoughts weekly or monthly. They are great for developing mantras and building on a single idea for a prolonged period of time. Recently my amazing friend Crystal gave me one and I love it! Not only do I enjoy the inspirational quotes, but I am always reminded of, and grateful for the amazing friend I have in her. So they also make wonderful gifts to inspire others. Yesterday we spoke of exposing ourselves to different sources of motivation and inspiration. Well I have come across what I feel is an excellent site for people who may find this whole taking control of your mind and using the power of your thoughts a bit too ‘new age’. It also works great for people like myself who on an occasion or several need a shove to be reminded to do the things we know we should be doing, but for a million different reasons are not. Now I caution some of the language on this site is a bit strong, but it is a great bold look at how to improve your life and empower yourself. the site is www.metalmotivation.com The esteemed gentleman who you will see and hear from, CJ, has some amazing ideas and serves as another great option to plug into for some great motivation and life changing tools. He also has some pretty great t-shirts there too. Check it out, if it works for you great! His concepts are some of the best I have heard in a long time. Have a passionate and thrilling day my friends! The voice in my head asked me a very interesting question the other day. Which is amazing because usually it is mentioning something about rum or pizza. Terrible vices aside, the question was “How many different languages are there in the world?”. To skip you from having to leave this site and head to Google, the answer, though debated is in the neighborhood of 6500. Why on earth is this relevant, and what does it have to do with living an amazing life? That is another great question and one that leads us to my next point. In the past how many things have we tried learning that just never ‘clicked’? I know I have quite a few. English language for one, which is ironic considering my book is almost complete. Maybe playing a certain musical instrument? Cooking a certain dish? Math? Science? History? Some of us just find a way to get through the subject and hope we never have a call to use it later in life. Imagine if we had applied this same logic when we were learning to walk, or to talk? There are some people I may speculate did give up, but that is a topic for another day. Truth is we just kept at it, often approaching the subject from every different angle. I began to ponder how this related to learning how to transform your life. Now before you think I am going to tell you to read a book on motivation written in Zulu when you live in Peru let us slow down for a minute. Think of how many books you have seen or heard of on how to improve your life? How many different life coaches are out there? We both know there are a lot in both categories. Why? If there is a magical secret do we need both “Don’t Sweat the Small Stuff” as well as “Think and Grow Rich”? If one person could teach us how to succeed in life to we need both the late Zig Ziglar as well as Tony Robbins? The answer in short is ‘yes’. To explain why, let me ask you another question. Do they all agree? To they all have the same plan and state it the same way? You know the answer is no. So who is right? They all are. Then again, they all are wrong too. Before you think I started listening to the rum voice in my head let me explain. We all are unique creatures. We all have had unique experiences. That is why it is important to expose ourselves to as many different voices as we can. I can think of no better field where this is so evident than self-improvement. Haven’t you ever been having a conversation with a group of people and had to ask someone “What are they trying to say?” When your friend explains it, suddenly you discover that person was speaking a language you know and they are not crazy. Ok, at least it should work that way most of the time. The difference here is just the words being used. So remember to do yourself the service of exploring as many paths to motivation as you can and go with the one, or ones, that work for you. I hope I will be one of them, but if not that is ok too. Just search and discover the voice that speaks to you! Following this blog is a great first step into having a motivational pick me up delivered right to your inbox, so be sure to click the link on how to follow this page to make it as easy for you as possible. I also suggest picking up some Motivational cds to listen to when in the car or if you have a free moment at home. A book or two would be great as well. Motivational movies like “The Secret” are good to have around when you just feel like you lose your direction or are just having a bad day. Feel free to print out your favorite posts from this blog to review when you need. Remember you are never going to agree with 100% of what anyone says, nor should you. Each of us has our own unique life and circumstances. Which is why it is so important to gather as many positive points of view as you can. Surround yourself with people who are positive motivated people who just might have slightly different way of going about the world. Keep your mind open to what everyone has to offer. If we drink a cup of coffee a day (or diet coke or whatever works for you) to keep our bodies going. We should at the very least expose ourselves to something motivational or inspirational to keep our souls and spirits going.